Tourist Attractions : Gondola ride to Apharwat (cable car), Khilanmarg, Splendor of nature and Snowy Mountains. Best Buys : Kashmiri shawls, kashmiri carpets, Tibetan handicraft items. Gulmarg is a hill resort of repute, not only for its beauty and prime location but also as being the highest natural golf course of the world, situated at an altitude of 2890 m. Hub of activity from mid-December to March, Gulmarg is an enviable winter sports resort with all the equipment and training facilities available for skiing, tobo-ganning, ski-bobbing and paragliding along with a T-bar lift, a chair lift and three modern ski-lifts. 53 km from Srinagar, Gulmarg is known as the meadow of flowers and was once a favorite haunt of Emperor Jehangir who collected 21 different varieties of wild flowers from here. It is the best Ski resort in the country and maintains the high-quality service. It also holds a position as one of the highest lift served Ski resorts in the world. It is the first place to offer heli-skiing in Asia, where a helicopter takes one to the chosen peak from where one can choose one's own descent route. Sledges and snow cycles are also popular here during winters and trekking opportunities here are numerous. The 18-hole Gulmarg Golf Club is in existence for 100 years and was established by Sir Neville Chamberlain. The Clubhouse, with its sloping roof, has a rare character. Golfing holidays here during summers are popular in this lush green bowl covered with a variety of alpine flowers with snow fed streams and rivulets passing through it. Apharwat Lake is frozen until mid-June and even after that, one can see ice floating in the river. For the more adventurous trekkers, climbing straight up the boulder-strewn slope of the ridge and descending on the other side to the path is a thrilling exercise. For those who love horse riding, Alpather Lake makes an exciting excursion for a day, starting early morning and returning late evening. Skiing: In winter, Gulmarg acquires a new persona - that of the country's premier skiing resorts. Skiing, to many who watch it on TV, seems like a very elitist sport, requiring a high level of training and expensive equipment. They are surprised, when they visit Gulmarg for a day's expedition to "see the snow", that others with the same level of physical fitness and training are skiing down slopes. Gulmarg is the ultimate beginner's skiing resort. One doesn't requite a heavy woolen wardrobe - slacks or a Salwar Kameez will do fine. In Gulmarg one will also be able to drift to one of the many Ski shops and hire skis, sticks and goggles. Just find yourself a ski instructor and set off down a slope. Neither does one need to exert oneself climbing up slopes. The gentlest slope of 200m is linked with a ski lift, which helps one to go up. When one graduates to intermediate level - which will happen after the first few days of practice, there are other slopes, longer and steeper, which are connected by chair lift. 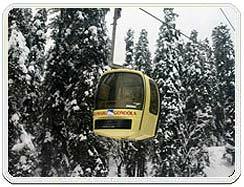 The longest ski run in Gulmarg is provided by the Gondola cable car, which allows a ski run of 2,213m. Outer Circular Walk: A circular road, 11-km in length, runs right round Gulmarg through pleasant pine forests with excellent views over the Kashmir valley. Nanga Parbat is clearly visible 137-km to the north, Haramukh 60-km to the east while to the south one can see the Ferozpore and Sunset Peaks and the Apharwat Ridge. Nanga Parbat, the 'lord of the mountains', is the fourth highest peak on earth at 8,500 metres. 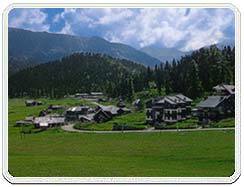 Air : Gulmarg is in Baramula District and is 56-kms from Srinagar District . The nearest Airport from here is situated in Badgam District, which is well connected with all the major cities of the country. Rail : The nearest railhead is at Jammu. Road : The journey from Srinagar to Gulmarg takes approximately 2 hours in bus and may take short time by chartered conveyance. 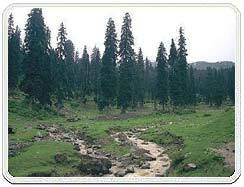 The road to Gulmarg is very beautiful and is lined with poplar trees all through. All sorts of transport are available to Gulmarg from Srinagar bus stand at Batmallo and from private transport operators.